There are times that Disney seems a bit more geared toward little girls than boys. 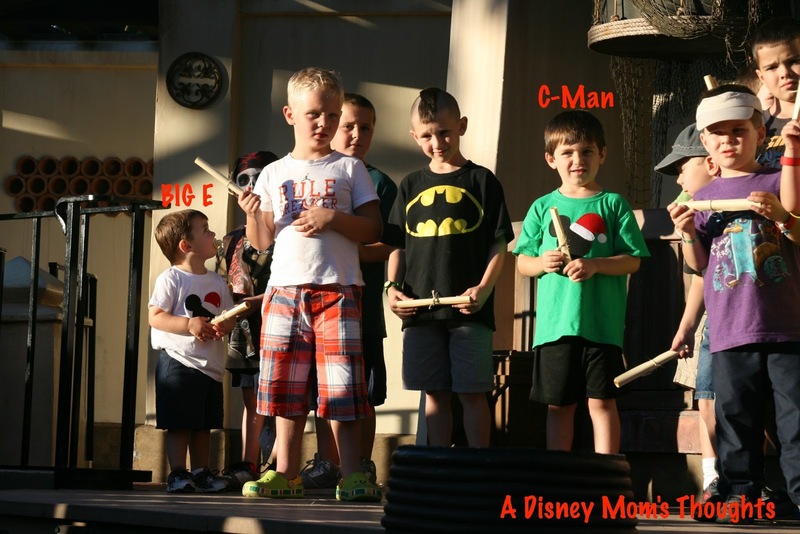 Since my baby boy is 18 and not so little anymore I turned to my wonderful friend Beth of A Disney Mom's Thoughts and asked her what she would consider the ultimate day in the park with boys would be. She planned a perfect day and I am sure it will help you mom's with boy when planning your next Disney vacation. I don't think I would take my boys to Walt Disney World for just one day. There is just way too much to see and do! 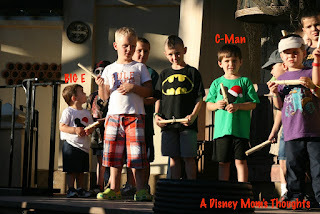 But for the sake of this post, I'll share some not to miss things we would do "Just for Boys" if we had one day at Walt Disney World. 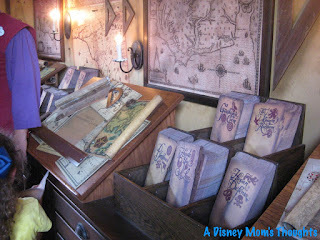 First, we would stay at Caribbean Beach in the Pirate themed rooms. 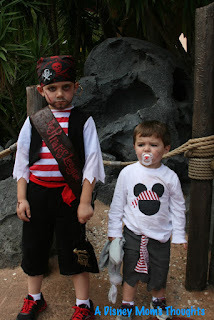 My boys, ages 2 and 6, love everything about pirates! 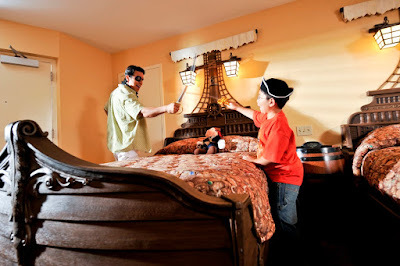 These rooms come with pirate ship shaped beds, a curtain closing off the bathroom area with a skull and crossbones, a table with a pirate compass, flooring that looks like wood planks from the ship deck and additional Disney touches that make you feel like you are on a pirate ship! This room would set the mood for the entire trip! The first park we would visit would obviously be Magic Kingdom. We would grab a park map and a times guide, then take our time going down Main Street USA where we would turn left at the hub and head to Adventureland! 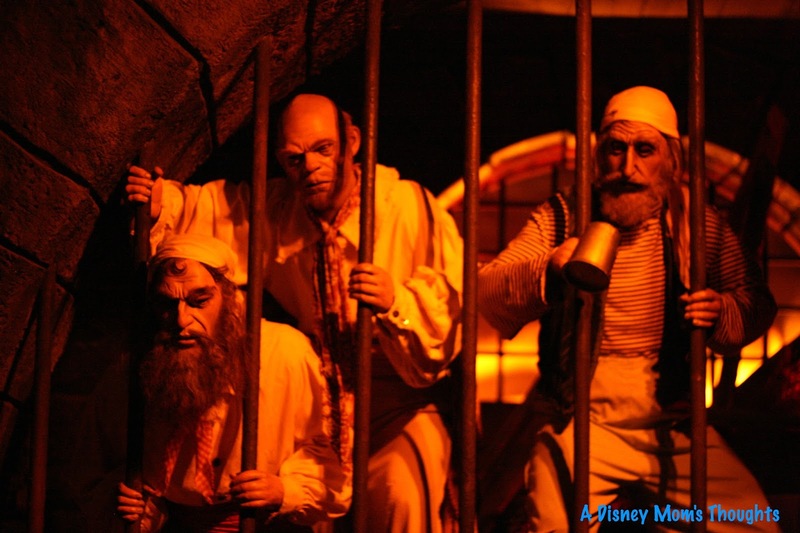 Our first attraction would be Pirates of the Caribbean since it is one of our favorite rides. We would then enjoy The Jungle Cruise and The Magic Carpets of Aladdin. 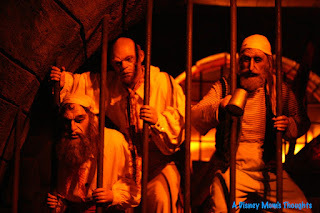 Once we had a few rides under our belt, we would enjoy A Pirate's Adventure ~ Treasures of the Seven Seas. To participate in this interactive adventure, head to the Crow's Next near Pirates of the Caribbean and pick up a magic talisman and the first of five maps. Participants get to help Jack Sparrow complete 5 unforgettable missions throughout Adventureland. Now it's time for lunch! We would enjoy a meal at Tortuga Tavern in Adventureland. This is a great Mexican quick service meal great for families. You can get burritos, rice bowls and Southwest Chicken Salad. The kids can get cheese quesadillas, rice bowls or an uncrustable sandwich. If you enjoy Mexican, give Tortuga Tavern a try! Once our tummies are full it's time for The Pirate's League! (This pirate make over does cost extra and requires reservations.) The Pirate's League is a great way to have your kids feel like real pirates. A Pirate Master will apply make up, eye patches, scars, beards and more to the pirate boys. Girls can choose to get a pirate or mermaid makeover. Once the make up is complete, accessories such as a Pirate sash, bandanna, sword and more are given to the new pirate. 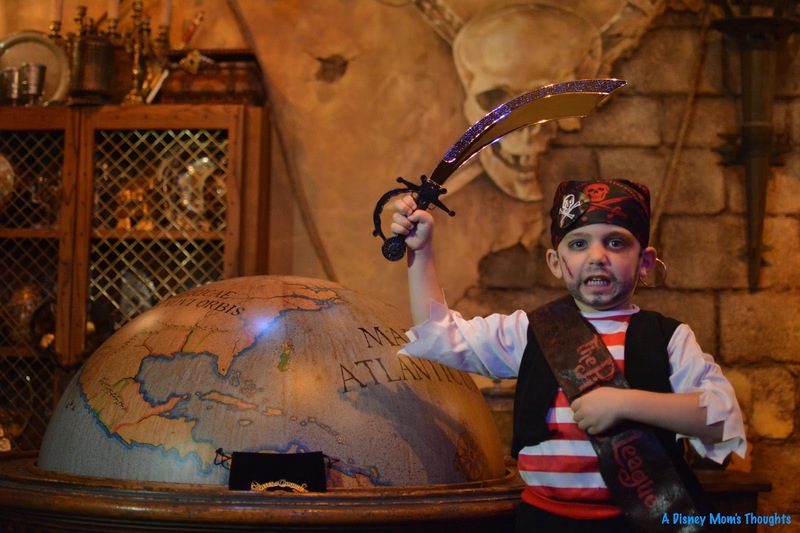 Pirate's are given access to a hidden room where photos are made and each pirate is given their own pirate name! We brought our own Pirate costume from home for C-man and since Big E was too young to participate (you must be 3 or older), I brought some black eyeliner to draw scars on his face and some cut off "pirate pants" and a sash to dress him in. He thought he was just as big as his brother! One plus to the Pirate's League is there is no age limit! Adults can be transformed into a pirate too! 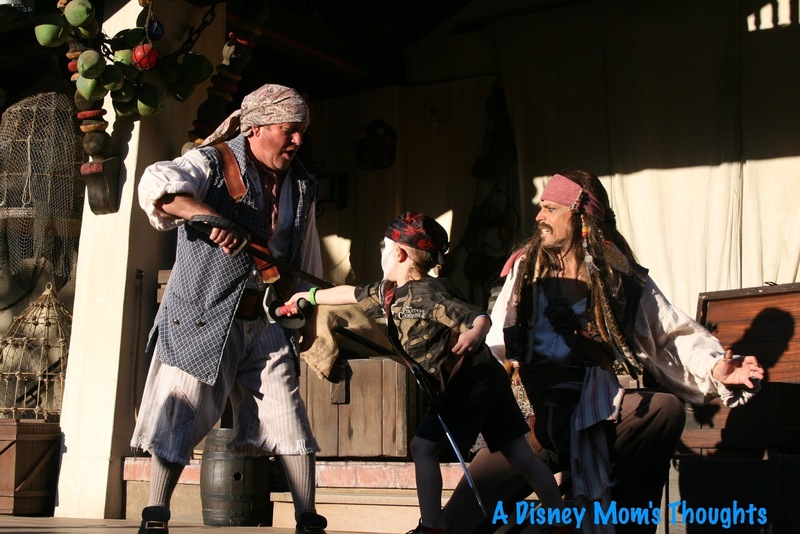 When the boys are transformed into pirates, it's time for Captain Jack Sparrow's Pirate Tutorial. This 25 minute interactive show teaches 4 kid pirates how to sword fight with Jack Sparrow. Prior to the show starting, the pirate helpers choose 4 lucky kids to participate. We found that the kids dressed as pirates or those who had been to The Pirate's League had a better chance of getting picked. Once the tutorial is over, all of the children are invited to come on stage and receive a membership scroll and take the pirate oath. 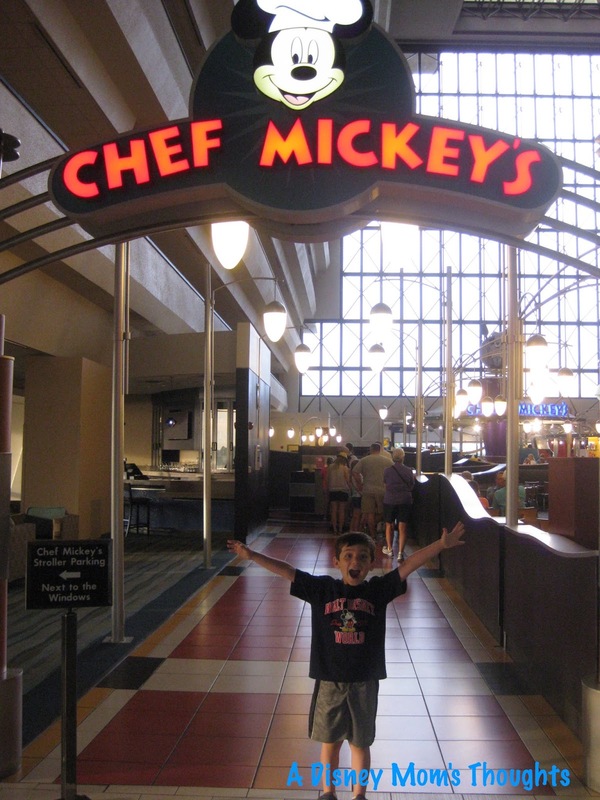 Once it's time for dinner, we'll take the monorail to Disney's Contemporary Resort to dine at Chef Mickey's. 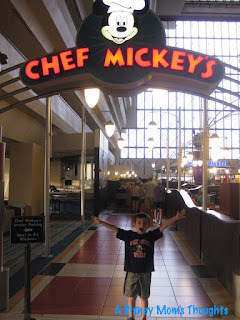 We had so much fun eating with Mickey, Minnie, Goofy, Pluto and Donald on our last trip. For dinner, they offer salads and pastas, carved beef and turkey, ribs, chicken, salmon, mashed potatoes, broccoli, chicken nuggets and mac and cheese. And our favorite part was singing songs and waving our napkins around! Since we are at Chef Mickey's, it only makes sense to end our day on the Pirate and Pal's Fireworks Voyage! (This too is an extra cost and requires reservations.) Starting in a ball room at the Contemporary, you'll enjoy all you can eat goodies including pop corn, pretzels, Mickey bars, cake, fruit and drinks such as water, lemonade and Pirate punch. 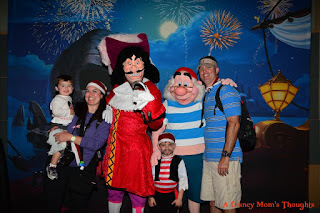 While you are eating, you can also have your picture made with Captain Hook and Mr. Smee. 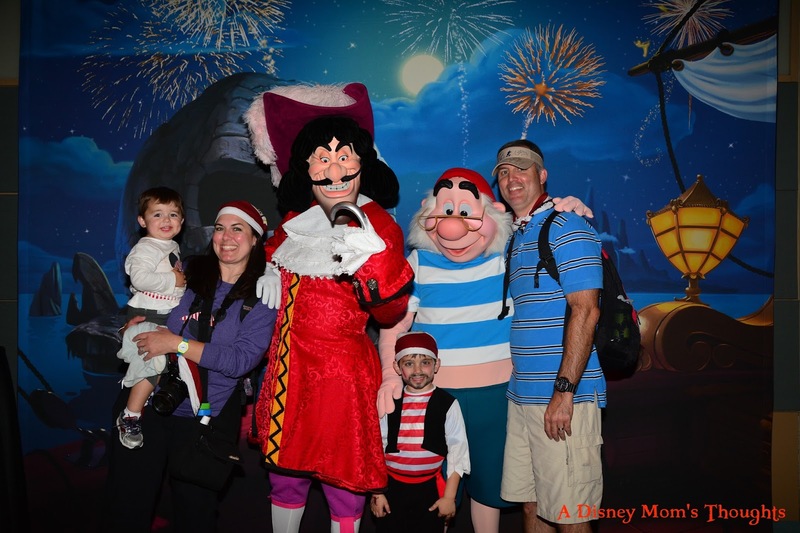 After enjoying this part of the party, the guests are divided into two boats hosted by Pirate Patch. The boats leave the Contemporary and sail into Seven Seas Lagoon to view Wishes Nighttime Spectacular from the water. While sailing, Pirate Patch leads the group in jokes, sing alongs, stories and more. On the way back to the Contemporary, Pirate Patch tells the story of Peter Pan and once you reach the dock, Pan is waiting for you! It was a lot of fun and my boys loved ending their day here! Thanks Beth! What a fabulous day! I would love to tag along!! Be sure to visit Beth at A Disney Mom's Thoughts and on Facebook and Twitter. She has lots of wonderful posts with travel tips, parties, crafts and product reviews.